Enter your email to be added to the waiting list. We will let you know as soon as the tour is open for registration. Please remember that this sign-up is not yet an official registration on this tour. Time to step aboard and find your place amongst the seadogs! We are happy to welcome you onboard the Pirates of the Baltic Sea! The biggest and baddest cruise on the Baltic Sea is calling you to hoist the masts and sail from Helsinki to Stockholm! Experience two nights full of fun and partying with over 2000 international students in the beautiful archipelago and one day of visiting Stockholm. International students from all over Europe are joining the cruise! There is a security check at the terminal; you cannot bring any opened bottles or alcohol onboard. In addition, to guarantee a peaceful stay for the other customers on board of the ship, the security might look badly on music players & speakers. They will be confiscated and you might not be allowed on the cruise. First we have a warm Welcome show in Atlantis Palace to start off the cruise! There is an all you can eat and drink buffet for everybody included in the price on the first night. You will know the exact time for your buffet latest at the harbour. During both evenings there are all kinds of activities on board. You get a complete digital timetable before the cruise. 7:00–9:30 Breakfast buffet open, you can buy a discounted voucher ahead of time. 9:30 Arrival to Stockholm Värtahamnen. Free time in Stockholm. Guided tours available in Stockholm for extra price. 16:00 Boarding gate closes, you must be on board the ship by this time. Both nights there is a Midnight Show organized by Silja Line in the Atlantis Palace and after that the DJ is playing until early morning hours in both New York Club and Atlantis Palace. 7:30–10:00 Breakfast buffet open, you can buy a discounted voucher ahead of time. Bus departure to your home city if your ticket included it. NB! If your ticket has included bus transportation, the busses will be waiting in front of the terminal in Helsinki; please find the bus that you came with, you can always stick to your Group Leader in case you cannot see the bus. Transportation to Helsinki IF your sections has requested it. Please, check the departure point when you are booking the trip. Fun program and party every night, all night long! 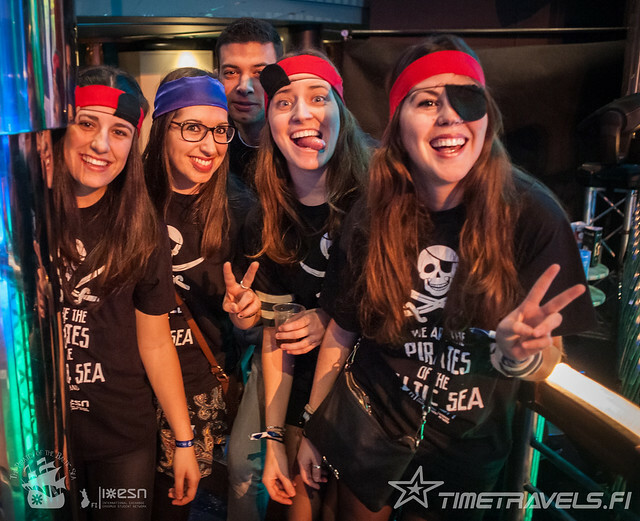 Dress code: PIRATES! Best costumes will be awarded. I have a problem with my registration, what should I do? Contact Timetravels +358104218990 (Mon-Fri 10-17) or email customerservice(at)timetravels.fi. Your online reservation will be cancelled automatically if the trip is not paid by its printed deadline date. As soon as you have paid, your participation is confirmed and you'll have a reserved place on the ship. Can I get a refund or cancel my booking? You are allowed to cancel your reservation with a 75% refund until 30 days before the trip. You may also provide us with a name change, i.e. sell your ticket to someone else, free of charge until 30 days before the trip during our office hours. After that the name changes and ticket resales are subject to an administrative fee of 20€, which is collected from the passenger in the Helsinki harbor prior to receiving their ticket. Name changes will be availalbe until at 12:00 GMT +2. I do not have a local section, what should I do? Can I get a ticket if I’m not an Erasmus student? This cruise is meant for all students who want to experience an international-minded student cruise! The trip is sold out - what should I do? Each local section gets a certain amount of tickets, if they are sold you can register on the waiting list. If there are free places later on you will be contacted from the waiting list. There might also be an open sale for any possible left over tickets. These open sale tickets do not include transportation outside Helsinki and are also might have other limitations, for example regarding cabin share. I want to sell my ticket to someone else – how can I do it? Yes, you can sell the ticket and make a name change. You can make one name change free of charge as explained above. After that the name change will be subject to a 20€ fee, paid by the new passenger in the Helsinki harbour prior to receiving the ticket. Please note that in case you want to sell your ticket to somebody else, you will need to find a buyer on your own. We cannot unfortunately take your ticket and sell it to somebody else or get you in touch with potential buyers. Is it possible to book a one-way ticket for the bus? It is possible to do, but you won't get any discount for it. If you're staying in Helsinki before or after the cruise, contact your local section to receive more information on what to do. Can I bring alcohol and food on board? You may not bring any alcohol to the boat. There is going to be a security check at the terminal for all participants and any alcohol found will be confiscated and you might be left in the harbor. You may bring a small amount of food and non-alcoholic beverages in unopened containers. Where does my bus start from? Contact your local section to find out. You should also receive an email with this information. When and where is the boarding? The ship departs from Olympic terminal in Helsinki at 17.00. Our boarding time is between 13–16, the exact time depends on your section. You will receive an email saying what time you should be at the harbor or the place your bus departs from. As we are a huge group, we recommend that you board on time and follow the instructions from Group Leaders. What is my boarding group? For students arriving outside Helsinki, your Group Leader will have the information. Participants who have bought their tickets from Helsinki sections (Aalto, Helga, Metropolia, Uni Helsinki) check your email to find out when you should arrive to the harbor. Those who have their ticket from "Open sale" have to board before 16:00. If you've bought your ticket from someone else make sure to ask where the ticket was originally bought from! If you feel confused and don't know where to go or when, we recommend that you arrive to the harbor between 13-15. Can I choose who I share my cabin with? You can give the names of your preferred cabin mates at the registration. Unfortunately we can't guarantee that you will get the cabin mates that you chose as all the cabins need to be full, but we will do our best to fulfill your wishes with this. Is tap water drinkable onboard? Can I drink in the hallway? Can I drink tax-free alcohol onboard? Only non-alcoholic beverages are allowed to drink throughout the boat. The bars are open until 4.30 and the prices are student friendly. Alcohol purchased from the bars should not be drunk in the cabin hallways. No. Smoking is allowed only on the outside deck area. I have a special diet or food allergies – can I still join the dinner? The dinner is a buffet and there are several dishes available, also vegetarian ones. Lactose and gluten free options should be clearly indicated on the descriptions next to each dish. If you have other food restrictions and you’re unsure of what you can eat or not, don’t hesitate to ask the local restaurant staff for help! Can we leave our luggage on the ferry when we go to Stockholm? During your day in Stockholm you keep your cabin and can leave the luggage there. Please note that neither the ferry company nor ESN Finland takes responsibility for any valuables left in the cabins. Can I pay with a bank card onboard? Yes, though Visa Electron might not work all the time. It's best to have some cash on hand just in case. Onboard it's possible to pay with Euros or Swedish kronor. We recommend that you change money before the cruise. It's not possible to do it in the harbor. You can of course just use ATM to get Swedish kronor in Stockholm. I did not find the answer to my questions, who can I contact?